Dude, with those eyes, it might be an improvement. It’s like the opposite of Youngblood’s disease. “No harm must befall my body, but since my head is already so jacked up, it’s open season on that.” Which is no surprise since that’s the only place villains ever shoot him. I heart the Iron Skull! What gets me is that he’s obviously drawn with the weird eyes on purpose. 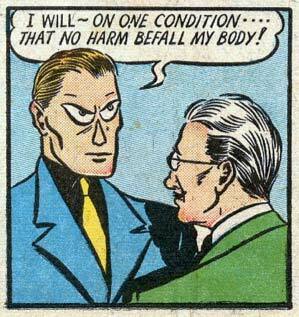 Other characters around him have normal eyes–maybe not brilliantly drawn, but nowhere near as screwed up as Iron Skull’s. I suspect they used a 14-gauge skull for the procedure that turned him into Iron Skull, but when they went to implant it, they discovered that his actual head only took a 12-gauge skull. As a result his face is stretched too thin making him have googley-eyes. Kind of like Joan Rivers. Youngblood’s disease. I love it. I’m going to be a long time getting over that one. He probably has lifts in his shoes to hide how small his feet really are, too. And I think you have it there, Jeff. people tend to shoot where they look, and really, who could look away from that face?